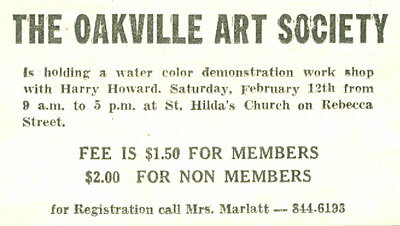 The Oakville Art Society was founded in 1965 with just seven members, plus Mrs. Esther Demeny - the founder and first president. The idea for an art society in Oakville was dreamed up by Mrs. Demeny, an accomplished artist, who taught classes from her home. Mrs. Demeny found that she not only needed more space for her classes, which she held in her living room, but also wanted to offer other types of art classes that were different from her area of expertise. Mrs. Demeny wanted to create a community space where art-minded individuals could come together to share and learn in the same space. With that in mind she started to make plans for what would become the Oakville Art Society. The first Annual General Meeting was held on November 18th, 1965 in which they likely discussed finding a proper home for OAS - that home would eventually be known as the Cottage located in Coronation Park. The original Executive team included: Mrs. Esther Demeny (President), Mrs. Gwyneth Young (Vice-President), Mrs. Jeanne Taugher (Treasurer), Mrs. Fern Hughes (Recording Secretary), Miss Elizabeth Loosely (Corresponding Secretary), Mrs. Claire Taylor (Publicity Chairman) and Mrs. Marjorie Marlatt (Membership). 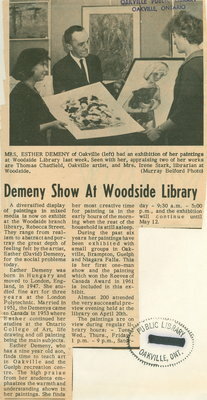 Newspaper Clipping: Mrs. Esther Demeny has an exhibit at the Woodside Library in 1964, one year before forming the Oakville Art Society. Pictured with her is local artist Thomas Chatfield who would become a member of OAS.